Simultaneously with loading file containing observation data, time-drawdown graphs for all observation wells are plotted in the "Main plot" window . Table with water level observed data in observation wells is displayed in the left part of the screen. To plot a graph use menu "Choose > Plot" or right click mouse on the plot field. 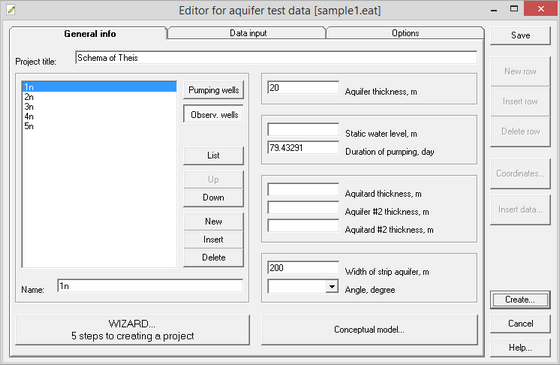 To select observation wells or observation points use menus "Select > Well" and "Select > Time". For data analysis use menu "Analysis" or right click mouse in the lower left corner of the plot to solve direct problem. To change coordinate axis use menu "Tools > Axis properties" or double click mouse in the coordinate axis field. To change the view of diagnostic curves use menu "Tools > View of curves" or double left click mouse on the plot field. For observation and calculation data scanning use menu "Tools > Value"
To create a window with the plot copy and simultaneously copy the plot to a clipboard use menu "Tools > Copy and clipboard"
Right click mouse in the table field first column launches a dialog box to convert the selected value to other units.